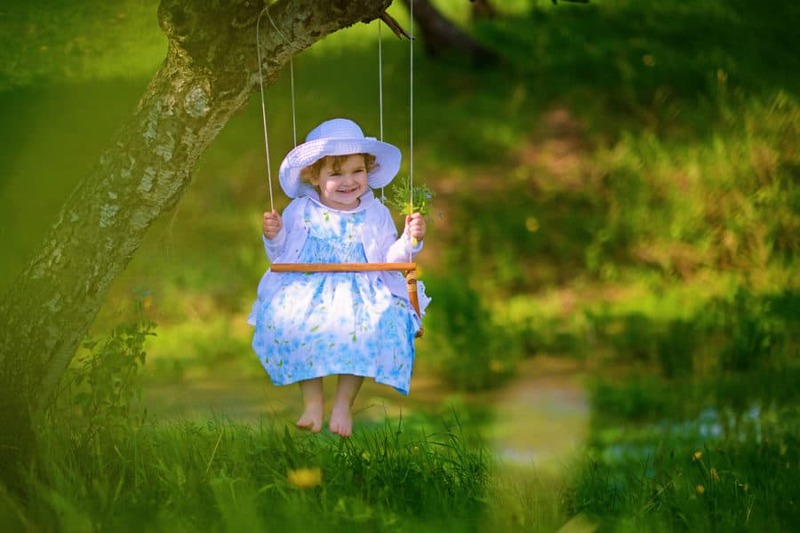 For decades, tree swings have been the primary joy of children when playing outside on long summer days. 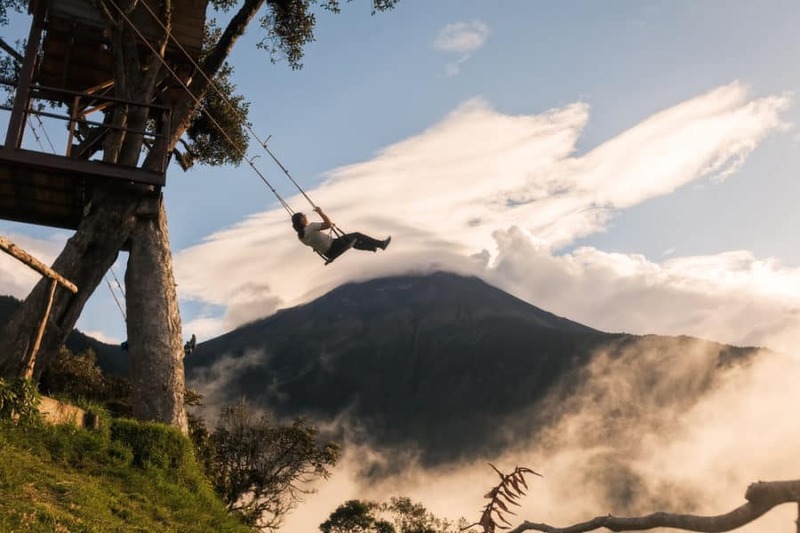 Not only can these swings be entertaining, but they can be leisurely as well. 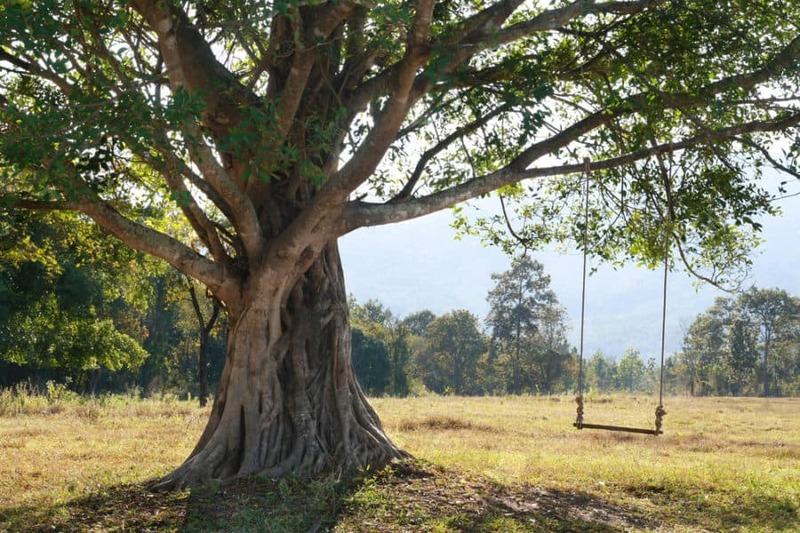 Tree swings come in all shapes and sizes, and not every swing has to be for rambunctious playing. 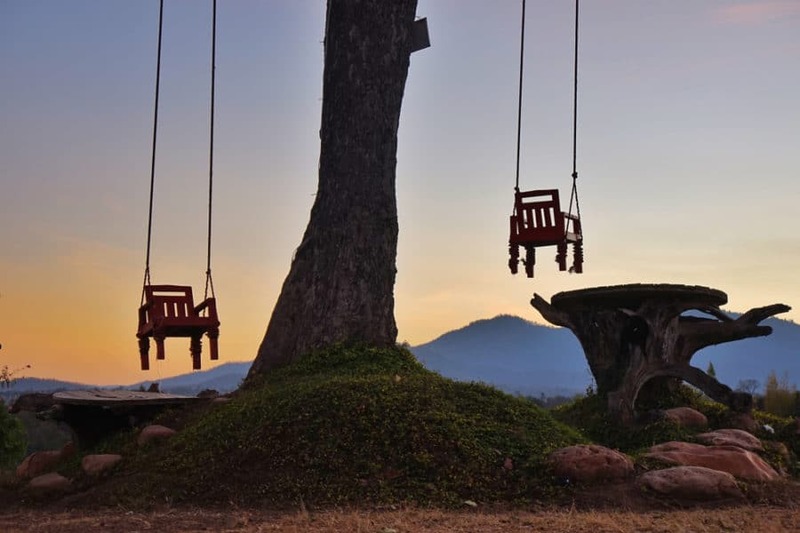 Here we’ve compiled 21 of the most unique tree swing ideas we could find, suitable for the child and adult alike. Take a look to see how you can transform your trees into something (even more) visually appealing and fun for the whole family! If you’re interested in more ways you can use your trees, check out our Tree Stump Ideas article! Wooden rope swings are the epitome of tree swings. These classics are perfect for both kids and adults! HGTV explains through photography and written instruction on how to build one. 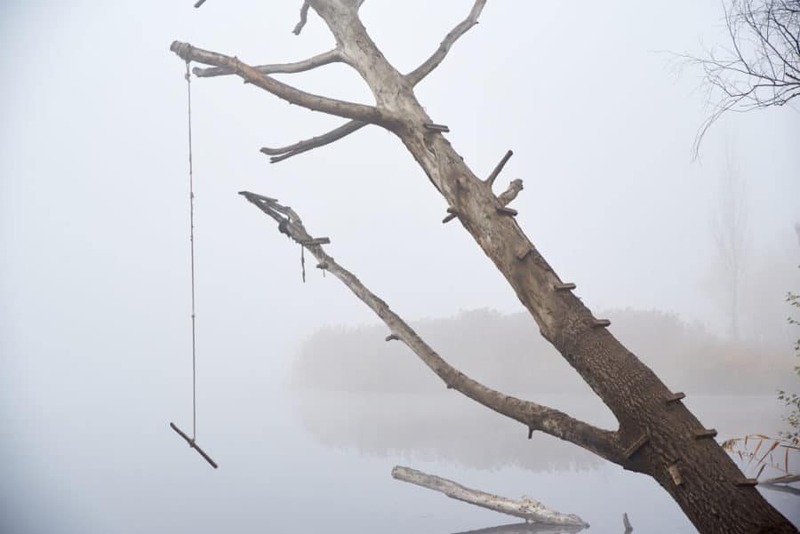 In only 14 steps you can build a wooden rope swing from scratch! See how here. 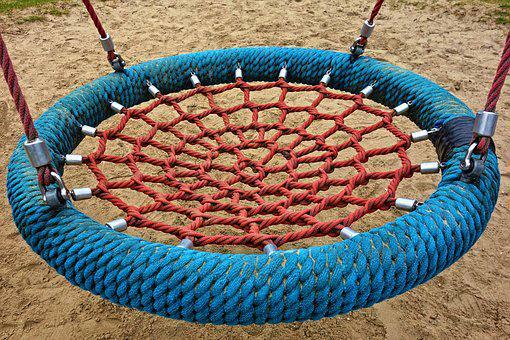 Tire swings are effortless to hang up, and an old-fashioned joy for kids to sit in and swing on! Not to mention they’re the most affordable swings on the market! The team at Hunker explains how to quickly (and effectively) hang your tire swing. Click here to learn how. Disk swings are supportive and easy to hang on to! They’re a blast for kids (and adults, too). This instructable not only explains how to hang your disk swing, but how to make your own entirely, as well! See how here. Flying saucer swings are spacious with a wide, solid base. Perfect for multiple kids to play on! 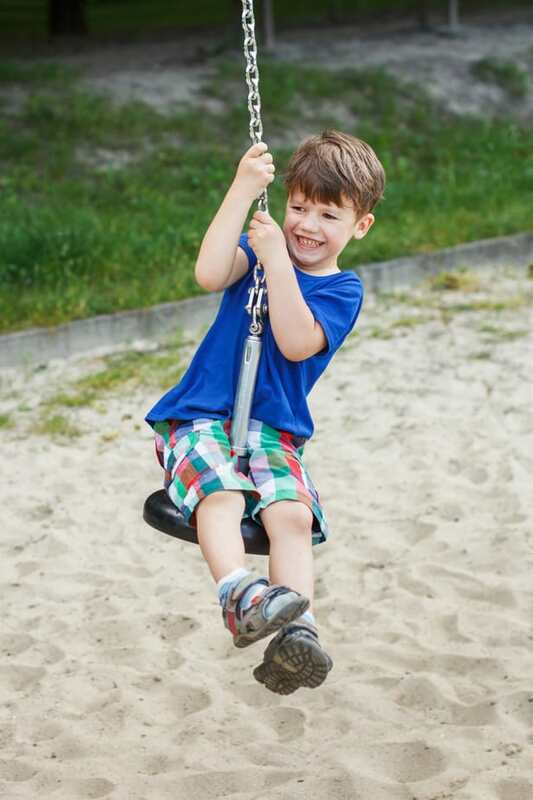 KcSwings discusses how you can choose the best flying saucer swing on the market! Read how here. Spider net swings don’t just look cool. They’re also sturdy, able to hold up to four kids at a time! Most of these swings have a maximum weight capacity of 400 pounds! Home Depot gives detailed instructions on how to install your own WebRiderz spider net swing on trees. Learn how here. Building an airplane swing may be quite the DIY project, but it’s sure to wow your children and spark their imaginations! 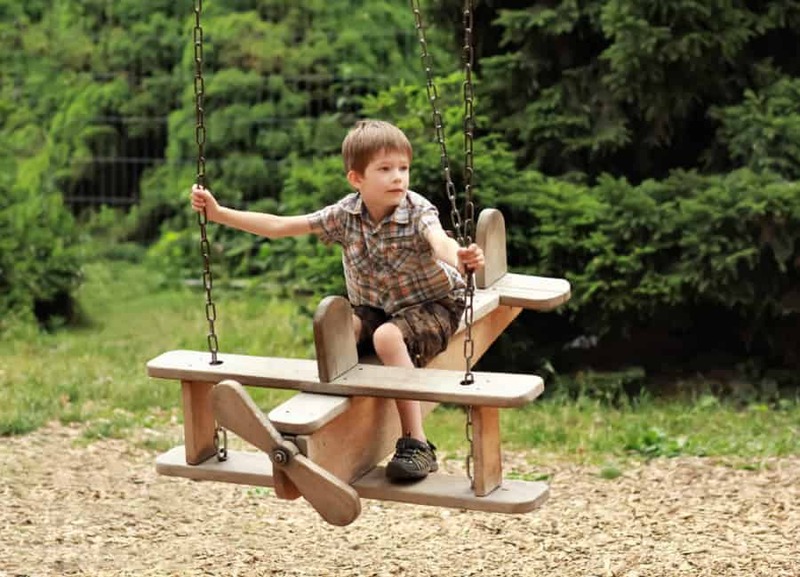 Kirsten at Dunn Lumber details how to build an airplane swing from scratch! See how it’s done. DIY skateboard swings are an innovative way to reuse the old skateboard in your garage. They make great standing swings for kids, and look cool too! Ben at HomeMade Modern uses photos and step-by-step instructions to explain how to make your own. See how here! 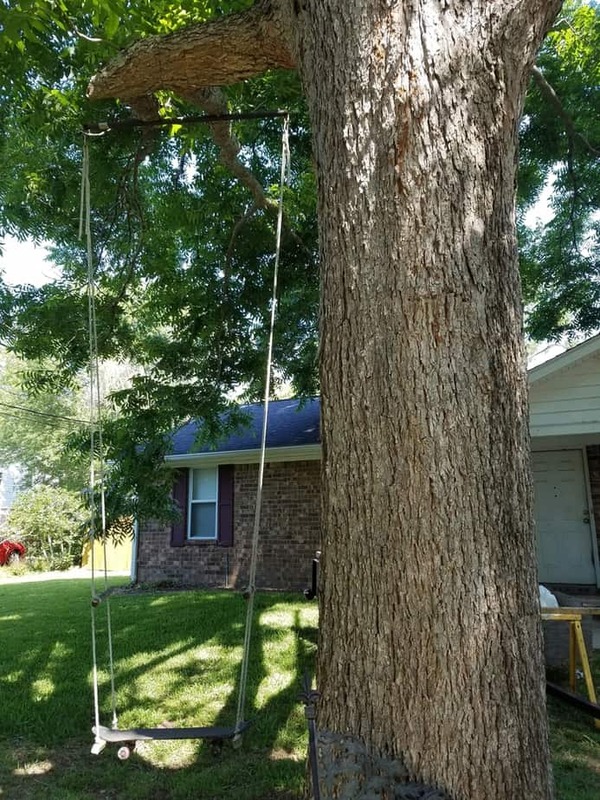 This tree swing may not be very comfortable, but it sure is a simple swing that can be easily constructed in a hurry. It’s perfect for kids who don’t mind a little rough play. 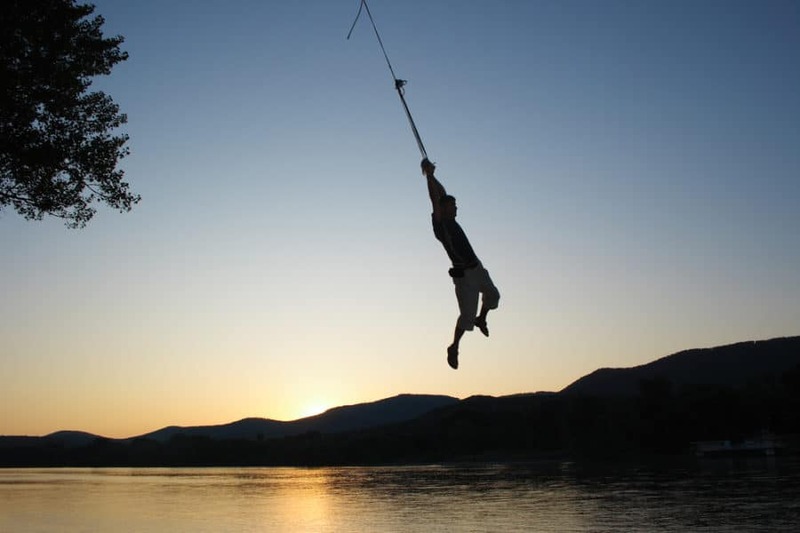 If you happen to have a pond on your property with trees next to it, a rope swing may be the ideal summer pastime. Not only are they fun, but they’re simply made from a long, knotted rope. Couldn’t be easier. If you have a treehouse in your backyard, or just want a huge project to work on, a tree house with tree swings is a grand idea. 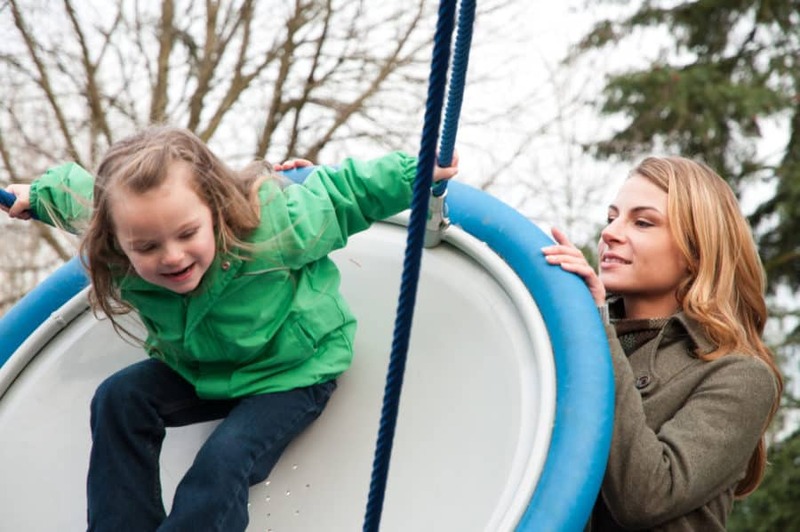 While your kids enjoy the imagination of their home in the trees, they can stop to swing any time they’d like. For very small children or babies, this wooden tree swing with a protective front and back bar would be the perfect addition to a young family’s home. It’s dainty, and adorable – just like your little one. Porch swings are a beloved piece of the past… but, what if you don’t have a porch? Megan at Hunker.com instructs how to stylishly hang a porch swing on the limb of a tree! See how to do it. What’s better than rolling around and getting tangled in a regular hammock? A hammock chair. No tangling, no stress – just sitting and relaxing. 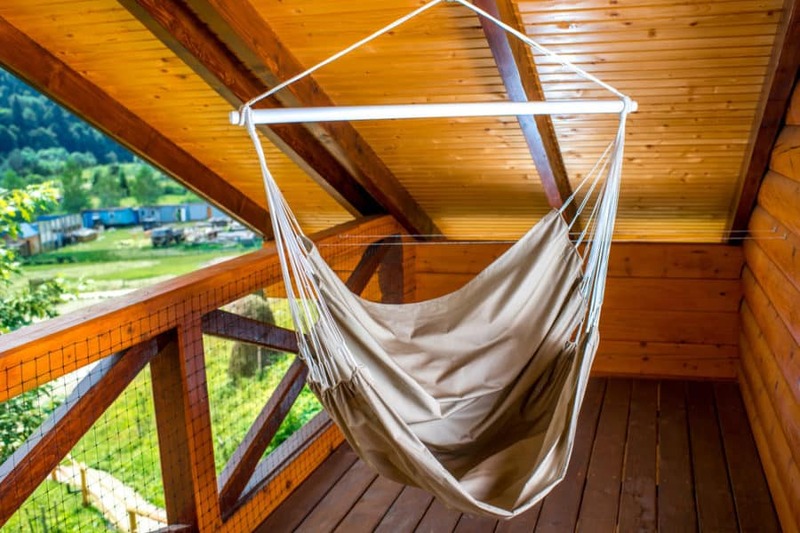 The New York Magazine lays out the best hanging hammock chairs of this past year. Browse for yourself. 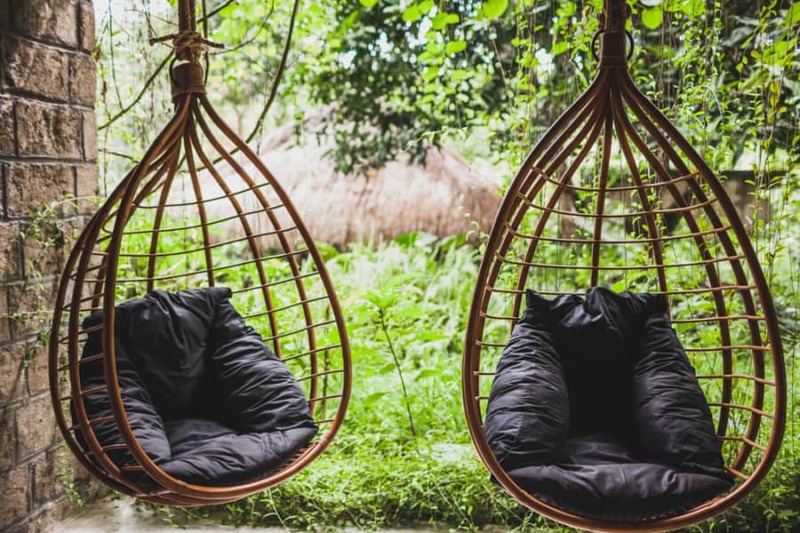 While traditional hammocks can be a little tricky to manage, they’re still a classic when it comes to outdoor lounging. They’re comfortable to lay on and great for a sunny afternoon. Yellow Leaf Hammocks describes the best methods of hanging your traditional hammock indoors and outdoors. See how. If you have an unused or old chair around your home, making a swing chair out of it is a great way to reuse it. 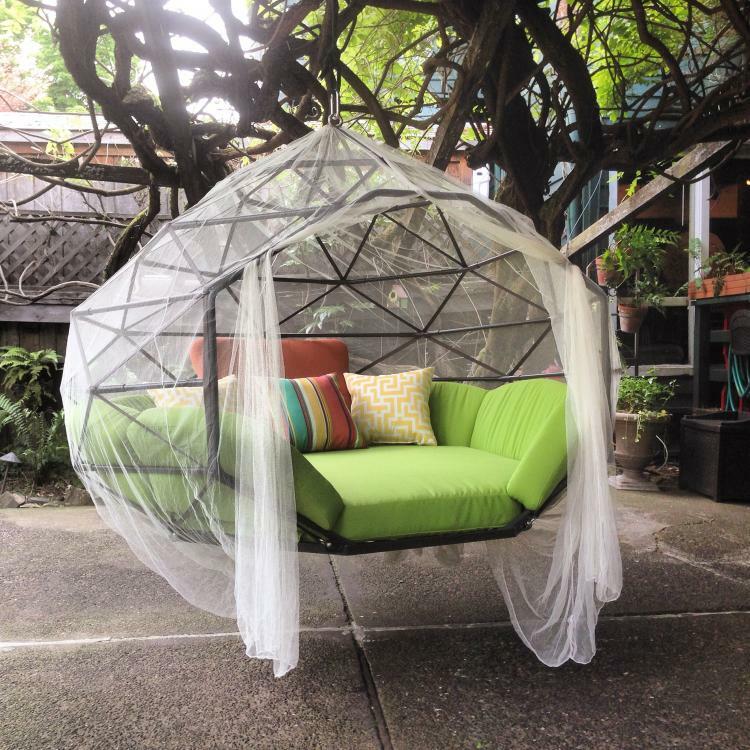 SFGate provides detailed instructions on how to create your own DIY swing chair. See how here. Caged hammocks are multi-person, huge hanging swings. They’re artistic and perfect for when you have a large family or friends who like to spend time lounging with you. You can learn more about these hammocks through the Kodama website, here. These 1960 design inspired rattan wicker chairs are the perfect addition to the backyard of an old soul. Just add cushions to the bottom to make your vintage-inspired chair a comfy seat to relax in. Hayneedle.com provides inspiration on how to decorate your rattan wicker chairs. See their ideas. This simple wooden rope swing is made elegant with the addition of fake wire flowers wrapping around the ropes. It’s a perfect way to transform your plain swing into something feminine and colorful. 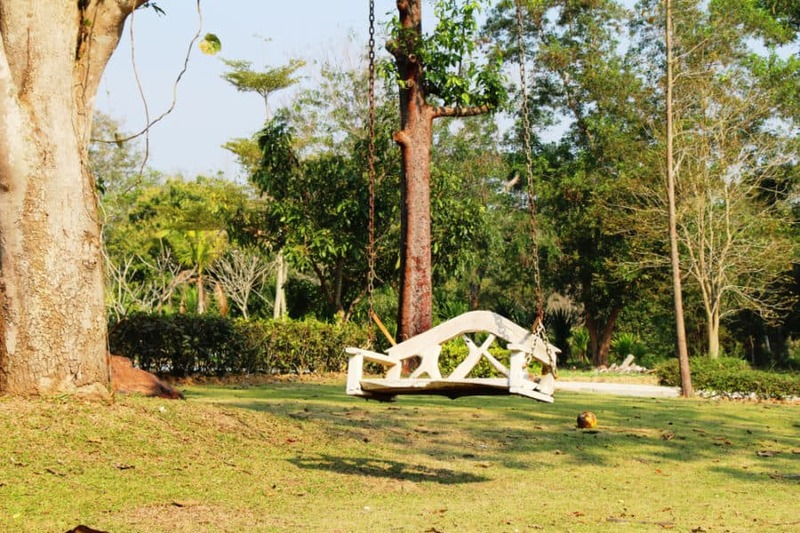 Swing benches, as shown in the photo, are a wide and spacious tree swing perfectly suited for relaxation. Not only are they large, but they’re odd-looking, adding a unique and distinct appearance to your already-personalized yard. 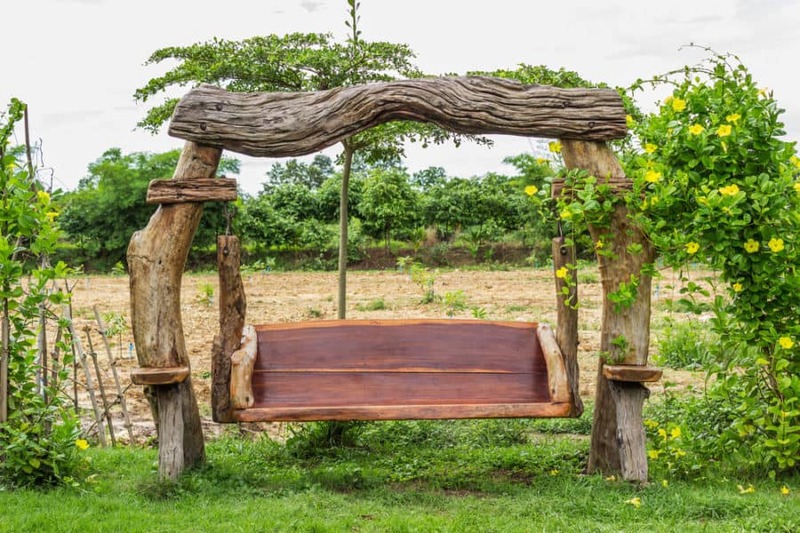 If you enjoy a rustic, country-side look, this wooden chair tree swing with a wooden beam may be the way to go. 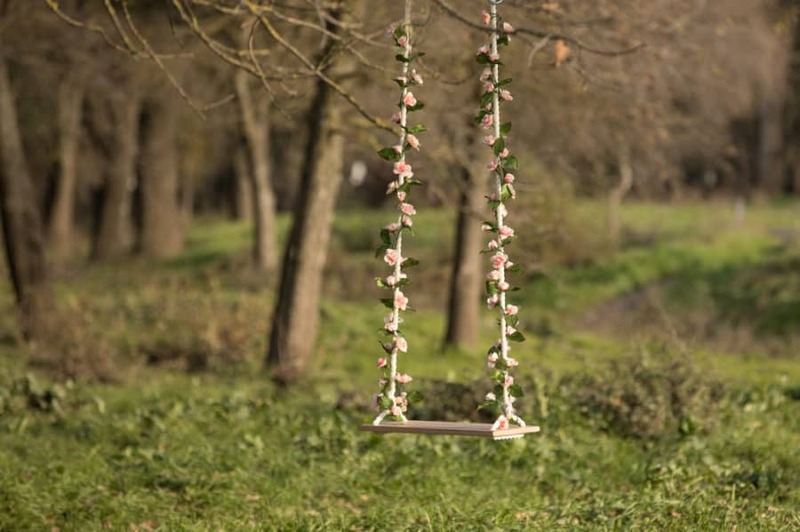 Not only does this swing give off a rural vibe, but it also blends in perfectly with the nature surrounding it as to not take away from the natural beauty in your yard. Last but not least we have this (quite literal) “tree swing”. 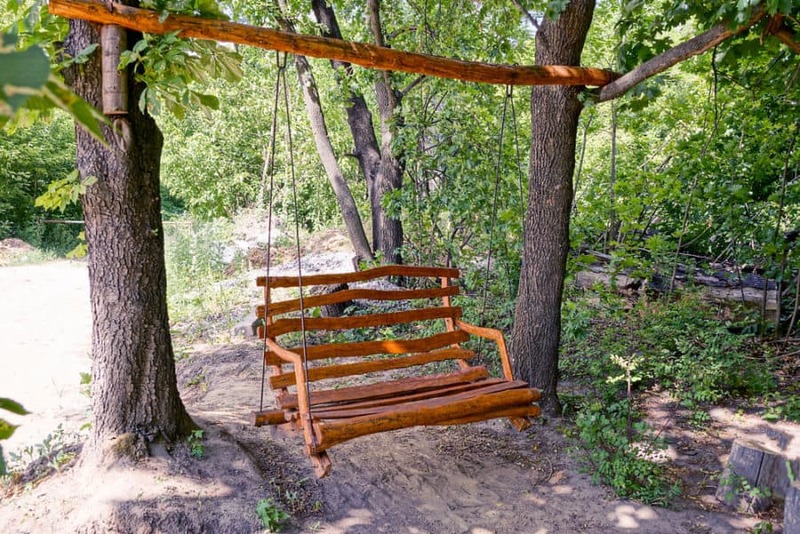 This backyard swing is made entirely out of rugged tree stumps and smoothed wood (aside from the metal bolts and chains). The obvious uniqueness of this swing is why we’ve included it on our list. How couldn’t we? 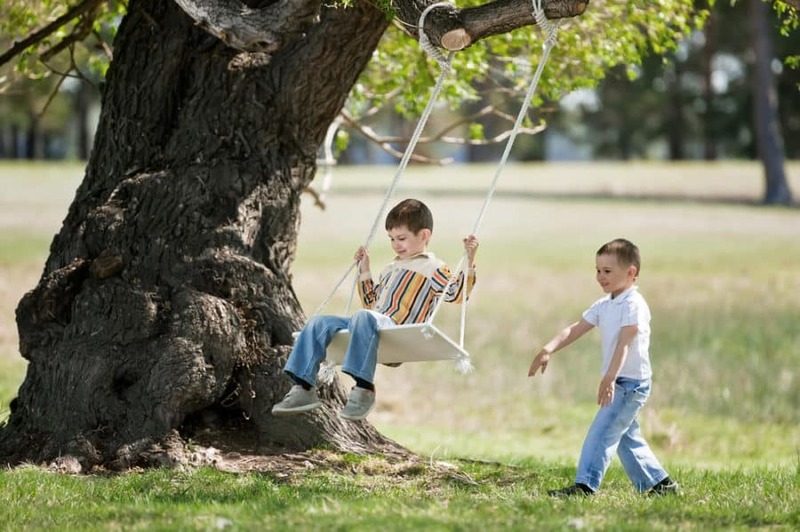 Tree swings have been a favorite for centuries, and not every tree swing is the same! 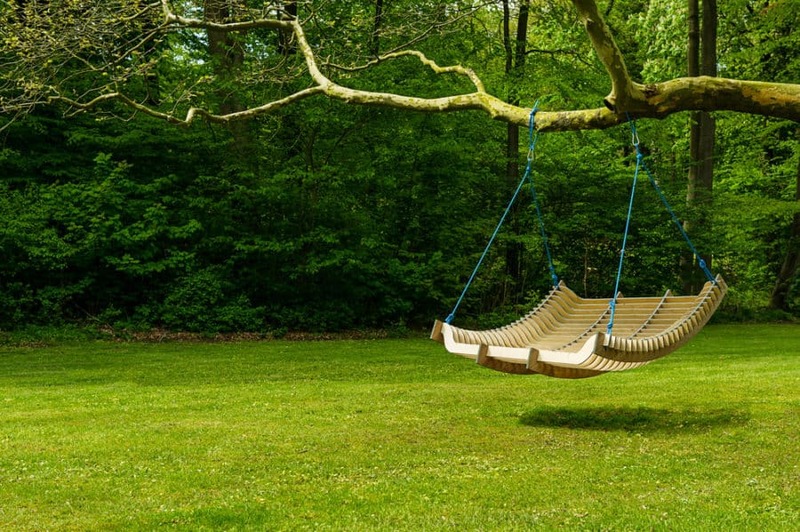 We hope you enjoyed our unique list of best tree swing ideas and got some ideas of your own! Happy decorating! Need more design ideas? Check out our Pergola Ideas, Enclosed Patio Ideas, and Landscape Border Ideas articles!